Trigger point therapy is sometimes regarded as one of a group of treatment aproaches called neuromuscular therapy or NMT. Myotherapy, developed by Bonnie Prudden , is a related type of trigger point therapy. Trigger point therapy was developed by Dr. Janet Travell in the United States in the 1940s; she is credited with having first used the phrase “trigger point” in print in 1942. Through her work and events in her personal life, Travell advanced the theory that pain experienced in one part of the body is actually caused by an injury or dysfunction in another part of the body. Ultimately, she mapped what she termed the body’s trigger points and the manner in which pain radiates to the rest of the body. Travell’s work came to national attention when she treated President John F. Kennedy for his back pain. Trigger points are thought to result from a variety of causes, including birth trauma, hypoglycemia, vitamin B6 deficiency, food allergies, traumatic injuries, poor posture, skeletal asymmetry, overexertion, or such diseases of the digestive tract as ulcers and irritable bowel syndrome. During times of physical or emotional stress, the points cause muscles to spasm. Travell’s therapy called for the injection of saline (a salt solution) and procaine (also known as Novocaine, an anesthetic) into the trigger point. Although beneficial in the relief of pain, the injections are a painful procedure for some people. In the 1970s, Bonnie Prudden, a physical fitness and exercise therapist, found that applying sustained pressure to a trigger point also relieved pain. Prudden developed her techniques over a number of years and called the treatments myotherapy. Myotherapy is beneficial to patients who find that trigger point injections are too painful. 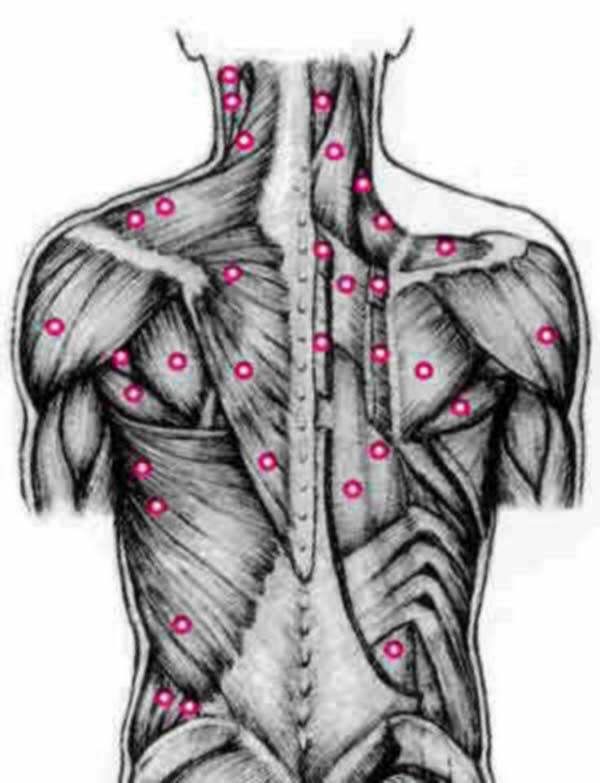 Trigger point therapy is said to interrupt the neural signals that cause both the trigger point and the pain. The object is to eliminate pain and to reeducate the muscles into pain-free habits. In this manner, the swelling and stiffness of neuromuscular pain is reduced, range of motion is increased, and flexibility and coordination are improved. The therapy can also relieve tension and improve circulation. The list of conditions that benefit from trigger point therapy include arthritis; carpal tunnel syndrome; chronic pain in the back, knees, and shoulders; headaches; menstrual cramps; multiple sclerosis; muscle spasms, tension, and weakness; postoperative pain; sciatica; temporomandibular joint syndrome (TMJ); tendinitis; and whiplash injuries. Typically, a health care professional refers a patient to a trigger point therapist. The therapist will take a history of injuries suffered, occupations held, and sports played. He or she will ask the individual to describe the pain and its location in detail. The therapist will then probe the area of the coordinating trigger point. An injection of lidocaine, saline, or other medicines, or probing with a dry needle, may be done. In myotherapy, once the point is found, the therapist will apply sustained pressure using the fingers, knuckles, or elbows for several seconds. Pain relief is often experienced immediately. Following the injection or pressure treatment, the therapist will then gently stretch the muscles of the trigger point. Finally, a series of exercises is taught to the individual to reeducate the muscles and to prevent the pain from returning. Workbooks are now available to help patients maximize the benefits of trigger point therapy through self-treatment at home. Persons should consult a health care professional before beginning trigger point therapy to insure that the pain is not caused by fracture or disease. In fact, a certified trigger point therapist will not provide services to someone who is not referred by a health care professional. The therapy is usually conducted on a padded table or treatment chair. The individual should wear comfortable loose-fitting clothing. An ongoing, honest interaction with the therapist will facilitate the sessions. Treatment sessions can last 30 minutes to an hour. The range of cost is approximately $45–60 per session. Acute pain can be relieved in as little as one session. Chronic pain may require numerous treatments. Persons with infectious diseases, open sores, or recent injuries should wait until they have recovered before beginning trigger point therapy. Persons taking anticoagulant prescription drugs may experience bruising after trigger point therapy. Research into the effects of trigger point therapy is sketchy, although the growing acceptance of acupuncture within the mainstream medical community has led to a few recent published studies of trigger point therapy. Interest in trigger point therapy is growing in Europe and Asia as well as in the United States; one recent study by a group of Japanese researchers reported that trigger point therapy was superior to standard allopathic drugs in relieving the pain of renal colic. The American Academy of Pain Management (AAPM) reports that studies of trigger point therapy on back pain and headaches have been conducted on groups of fewer than 10 people. The AAPM does, however, recognize trigger point therapy as a valid approach to the management and relief of pain. In the traditional medical community, trigger point therapy is viewed as a complement to treatment. Patients are referred by a variety of health professionals including psychiatrists, orthopedic surgeons, and anesthesiologists.